Untized optics guarantee proper alignment. Can take up 2 optical accessories. Internal gasket prevents 100% of all light leakage. 50 Watt 12V (For housing BL20IC, BL20N-E,BL2R-E,BL21). 30 Watt 12V (For housing B2 and BL2IC). 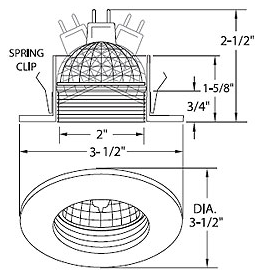 Click the button below to add the 2" 12v Adjustable Stepped Baffle Trim to your wish list.